Wheelbase leverages segment.com for providing integration into hundreds of online services, including tracking for Facebook, Google Analytics, and Google Adwords. For most customers, the free account offered by segment.com is sufficient - if you have a high volume or are interested in adding any of their advanced integrations, there is a fee. This fee is not connected to Wheelbase in any way, so you'll want to check out there pricing page for more information. For most customers, this is not an issue and the integration will be free. Once you've created your account, you'll want to create your first source. We've included some steps below, but Segment may have changed things since the time this document was created. If you get stuck, let us know and we'll update the guide! For every customer that hits you personal shop or checkout process, we issue identify commands, page views and checkout steps for conversion tracking. After you've created your account, the very next screen will walk you through setting up a source. You'll want to select 'My Website' as the type of source. 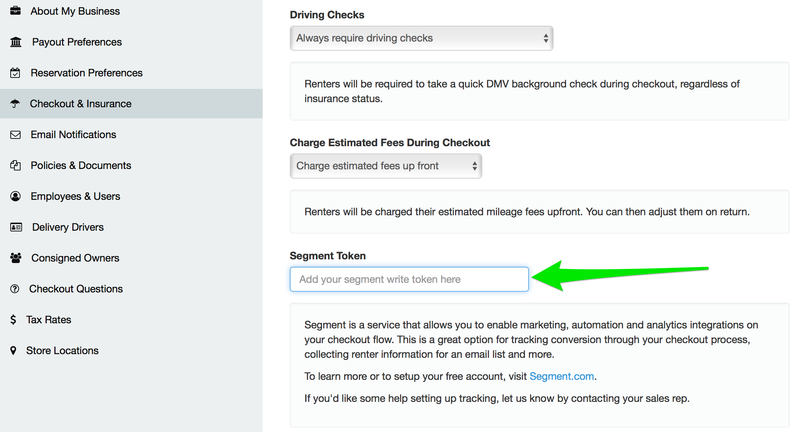 Finally, paste the value into Wheelbase on your Checkout Settings page and click "Save"